Manny pacquiao no.1 pound for pound title no. 2 Floyd mayweather jr, manny pacquiao latest news updates, paquiao the greatest boxer of all time, juan manuel marquez latest cheat foor stopper, pacquiao pound for pound king, is there 4th fourth rematch of pacquiao vs marquez this coming may 5 12? or mayweather vs pacquiao on may5 2012?manny pacquiao still poun for pound king by the ring magazine. Despite the unexpected performance and unconvincing win by the Filipino Champ Manny Pacquiao, the Ring Magazine has still voted Pacquiao and remained as top 1 pound for pound boxer of the world. But some boxing sites, Pacquiao dropped his top 1 ladder to top 2 replacing Floyd Mayweather Jr.as number 1 pound for pound title. On the other side, Manny Pacquiao lost his pound-for-pound title to Floyd Mayweather, Jr. in the recent rankings released by two sports media outfits - ESPN and Sports Illustrated. As posted in the sports media on November 14 and November 17, Pacquiao has dropped to 2nd place while Floyd Mayweather, Jr. moved up to top place. The recent movement in the rankings was brought about by Pacquiao's latest fight with Mexican Juan Manuel Marquez on November 13 (Philippine Local Time). What Pacquiao's consitently as reliable pound for pound king is the hope of the Ring Magazine upon retaining Pacquiao as the number 1 pound for pound and not Floyd Mayweather Jr. No question about that, because it was an official list of pound for pound boxers of the world. But some boxing fans, maybe they're in doubt about Pacquiao as number 1 pound for pound because of his previous performance. 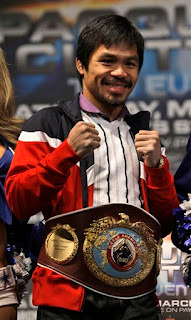 But what can clear the doubts, may Pacquiao and Mayweather will showdown each other this coming May 5 2012, if so. The “Pound for pound” rankings were developed by boxing writers during the era of Sugar Ray Robinson to rank the world’s greatest fighters irrespective of their weight division. Can you guess the top 10 list of pound for pound boxers when giving you the right for it?